I have been with Verizon for longer than I can remember. I stuck with them during the era of crappy phones and odd billing mistakes to their somewhat dominance of the wireless game. A girl I used to date works for Verizon and I usually get any skinny from her on upcoming Verizon fun stuff. I harass her from time to time on Blackberry messenger about the new phones. She is the girl who kept me from making bad phone decisions such as the DARE or the STORM. I've had a Blackberry for so long it would take one hell of a phone to make me stray. Today I asked her some questions about the new Verizon Droid while chatting on our phones. Me: Have you played with the new Droid yet? Me: Are they better than the Blackberry? Her: Can't decide. Personal opinion I think. Me: What are the coolest things about it? Me: What is the least coolest thing about it? 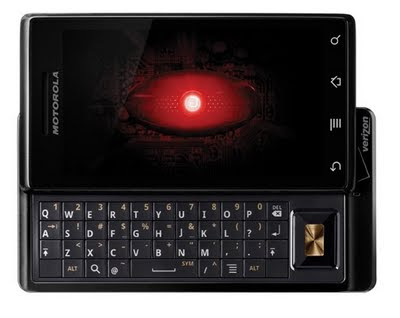 Her: It's made by Motorola. Me: Are you going to get one? Her: I wanna wait and see if they have problems. Me: Who was the best kisser you've ever been with. Her: What does that even mean? Me: Of all the guys you've kissed. Who was the best. At this point I think her keyboard stuck and she wasn't able to type in my name. I also believe her battery died and possibly her phone even exploded. So what does this review tell us? Not much, about the phone or my kissing. I think I've just wasted everyone's time and I think my ego has just been deflated a bit. I hate my phone.